It is a sun catcher that imaged cherry blossom petals dancing in the spring wind. Swarovski of unusual flower form was used plenty of Swarovski of various kinds of large and small cut beads. At the bottom, use 30 mm ball made by Ashuru of high quality crystal glass. It is an expensive crystal glass of quality equivalent to that of Swarovski. (There is a stamp with birds flapping on the top) It is harder to cut and can be used for a long time because it uses materials that are more resistant to ultraviolet rays than Tegus (transparent cord) used for general san catcher. You can enjoy the sunshine during the day and enjoy lighting up at night. All the glass beads are also made by Swarovski Corporation. Suncatcher has been popular among people in the 20th to 60th era, "Room is bright and bright", "Healed by the brilliance of the prism ♪" and a wide range of people. Especially for people ranging from 25 to 35 years old, there are many who purchase as gifts such as birthday gifts and wedding gifts · birthday celebrations are many interior accessories. * What is Suncatcher? * It is a kind of accessory made of small glass that reflects light, hangs on a curtain rail etc and takes in light into the room. In Feng shui is said to "call fortune", it is a very auspicious accessory. Of course, it is an item of recommendation for wedding celebration and birth celebration, moving celebration, new building celebration, sympathy goods as well as birthday gifts. ◆ Size · · · about 35 cm (when hanging) ◆ Material ... 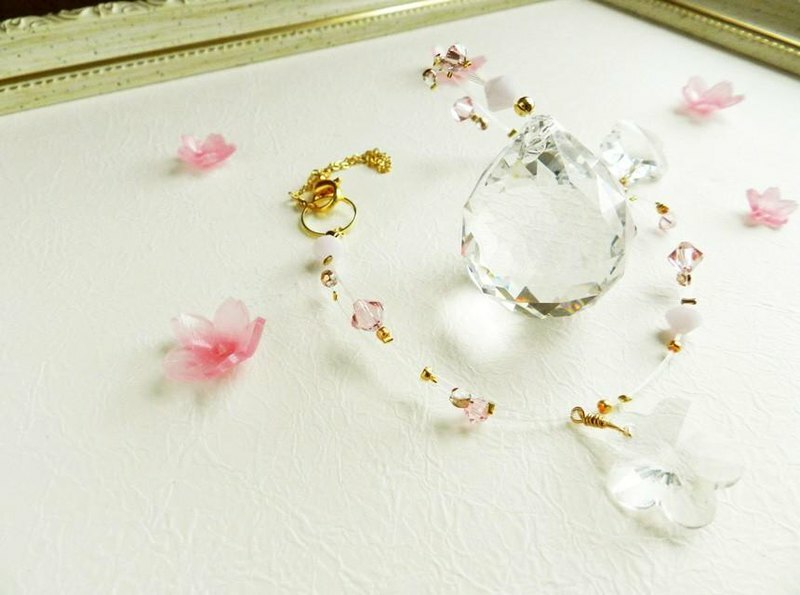 Crystal glass (light transmittance: 93%), metal beads, chain ◆ Production: Japan 【please note】 * The color may look different on the screen and the real thing. If you have any questions, please contact us. * When ordering multiple works, actual shipping fee and some errors may occur. Please note. * Please be careful not to catch or hit the sun catcher, such as opening and closing the curtain and the window, in use. * Accessories are very delicate. When adding excessive force or getting wet with water, it causes discoloration and breakage, so be careful with handling carefully.